Hepworth 27” x 60” (85” @ Gap with Risers) Spinning Lathe w/ Tailstock, Steady Rest. Fay & Scott 36” x 94” Spinning Lathe w/ Variable Drive Motor, Tailstock, Steady Rest. Bedinger 27” x 80” (60” @ Gap) Spinning Lathe w/ Drive-All Motor, Tailstock, Steady Rest. Custom Built 27” x 34” Spinning Lathe w/ Gear Drive, Tailstock, Steady Rest. P. Pryibil Machine 22” x 44” (44” @ Gap) Spinning Lathe w/ 5-Speeds, Tailstock, Steady Rest. Hepworth Machine 22” x 44” (44” @ Gap) Spinning Lathe w/ Lima Gear Shift Drive, Tailstock, Steady Rest. Roper Whitney 72” Power Shear w/ Manual Back Gage. By George mdl. CS5273 52” Circle Shear s/n C27488. 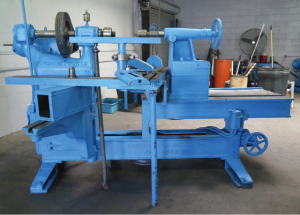 Whitcomb – Blaisdell 18” x 48” Gap Bed Lathe w/ 20” @ Gap, Inch Threading, Tailstock, 10 ½” 3-Jaw Chuck. Monarch 16” x 28” Lathe w/ Inch Threading, Tailstock, 8” 3-Jaw Chuck. Rockwell / Delta 20” Vertical Band Saw w/ Blade Welder, 50-4500 Dial FPM, 24” x 24” Table. Hydraulic H-Frame Press w/ Hydraulic Unit. Perkins OBI Stamping Press w/ 8” x 13” Bolster Area. DeWalt 3.7Hp Vertical Air Compressor w/ 60 Gallon Tank. Miller 330A/BP AC/DC Gas Tungsten Arc Welding Power Source s/nHD676501. 5-Speed Bench Model Drill Press. AE Adam mdl. WBW9A 9 Lb Cap Digital Counting Scale. Misc Benches, Racks, Shelving and Office Furniture. Check Master mdl. 220-151 CMM Machine s/n 19-30 w/ Renishaw TP-1 Probe Head, Metronics QC5000 Software, Computer, 30” x 41” x 6” Granite Table. Phase II 24” Vernier Height Gage. Standridge 36” x 48” x 9” Grade “A:” 4-Ledge Granite Surface Plate w/ Stand.